In accordance with the ISEAL Codes of Good Practice for Setting Social and Environmental Standards, our standards development process is deliberative, transparent, and subject to regular updating—all toward the ultimate goal of helping as many children and exploited workers as we possibly can, across a broad swath of countries where exploitative labor is rampant. By working closely with a number of stakeholders, NGOs, experts, and trusted advisers, we are able to establish and improve these standards according to the latest data that’s available. Our System Report provides further information on how we develop our licensee standards and ensure their effectiveness. What is essential for a sustainability standard to deliver positive impact? Watch this video by ISEAL to find out. We have an extensive collection of online resources for those interested in learning more. 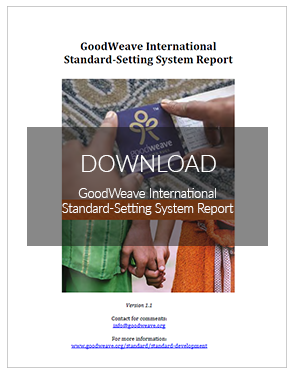 In addition to the links below, the Terms of Reference and current members of the GoodWeave Standards Committeean can be viewed online, as well as procedures for standards development and complaints.